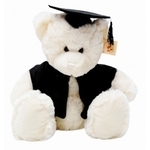 Graduation Bear with White Outfit | Graduation Bears and Gifts at discount prices! White Outfit - Perfect for Pre-schoolers and kindy graduates! Wearing a white satin gown with a white satin graduation cap and tassel and is proudly clutching a white felt graduation certificate tied with a black ribbon. The bear is our pre school customers favourite!